After doing a few oatmeal recipes with fruits and sometimes chocolate, it felt appetizing to vary pleasures by adding more savory flavor. 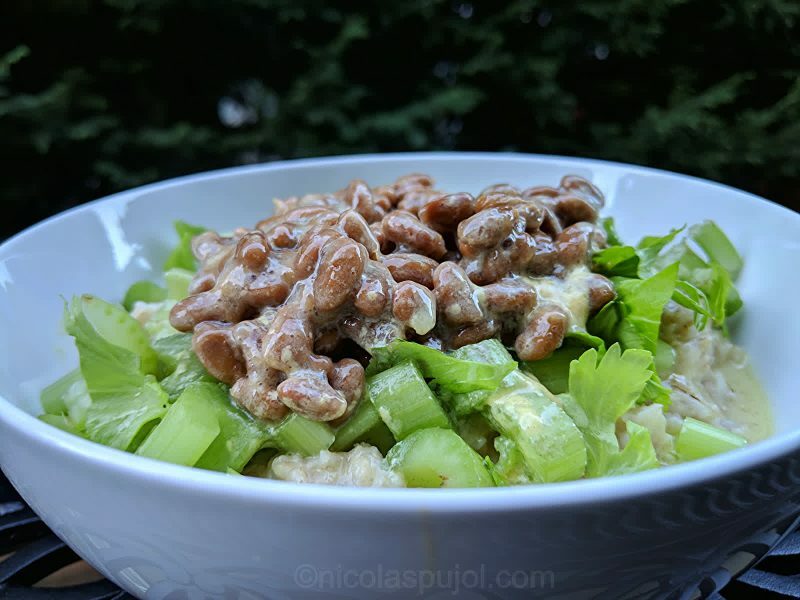 This natto, celery and oatmeal salad with no-oil lemon dressing provides a savory bowl with French mustard. Whole-foods plant-based no-oil (WFPBNO) recipe. 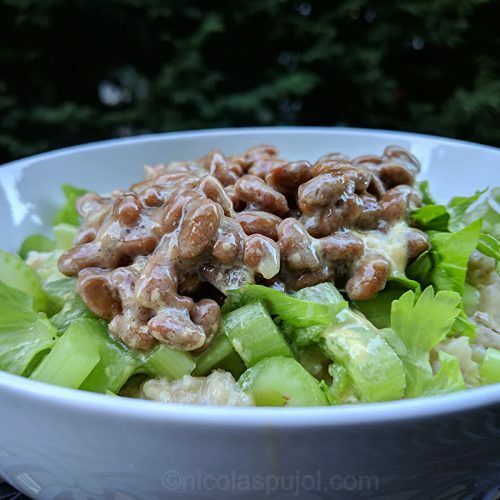 One thing that celery does, when adding it to a dish, is to add crunchiness. It is a little bit like eating an apple, or nuts. The human brain likes to sometimes have something harder, crunchy, to make a dish satisfying. 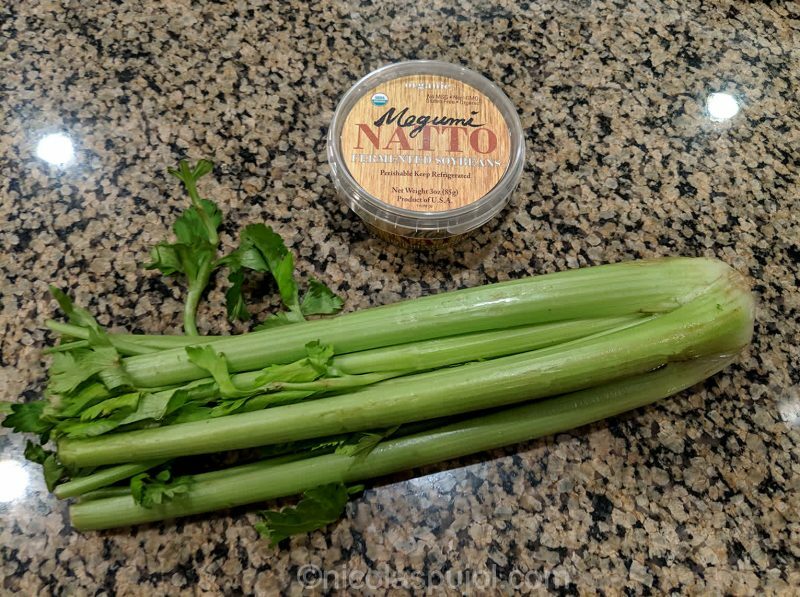 Celery is also a top source of plant-based nitrate, which seems to help improve cardio-vascular function. 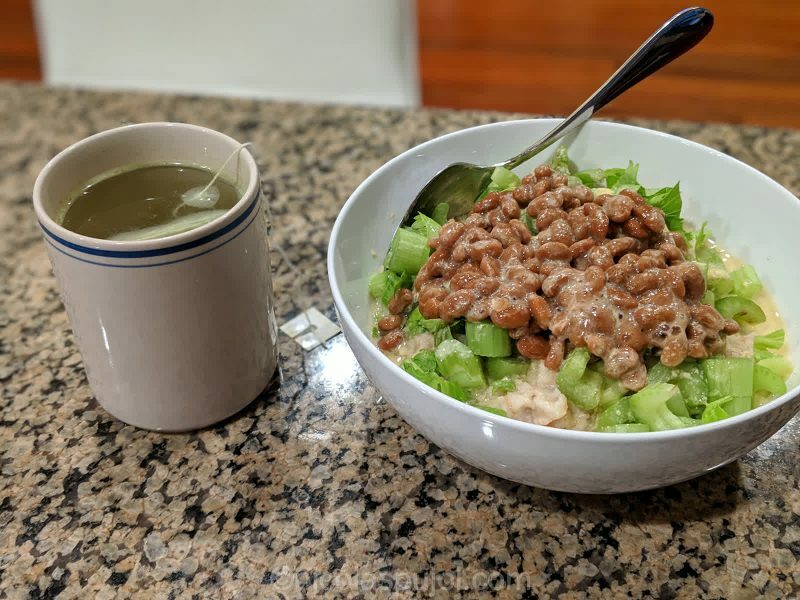 As for natto, I found lemon juice (lime in today’s recipe) to make a nice food pairing with it. 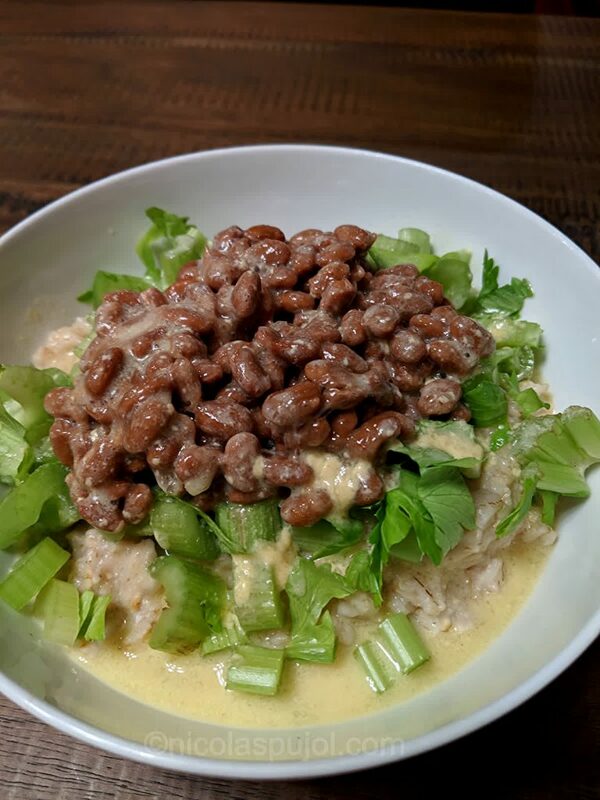 Pairing natto with lemon takes away some of the fermented flavor without losing the beneficial properties of natto, notably its vitamin K content. Last, this was very quick to make, under 10 minutes as most dishes we do on this site. Your time is precious, and so is feeling good after a meal, and I think this dish helps on both objectives. As for drink to go with the salad, tea is a wonderful choice. I used Japanese green tea, but you can go with Oolong, or a hot juice like a hot orange juice with tea combo. 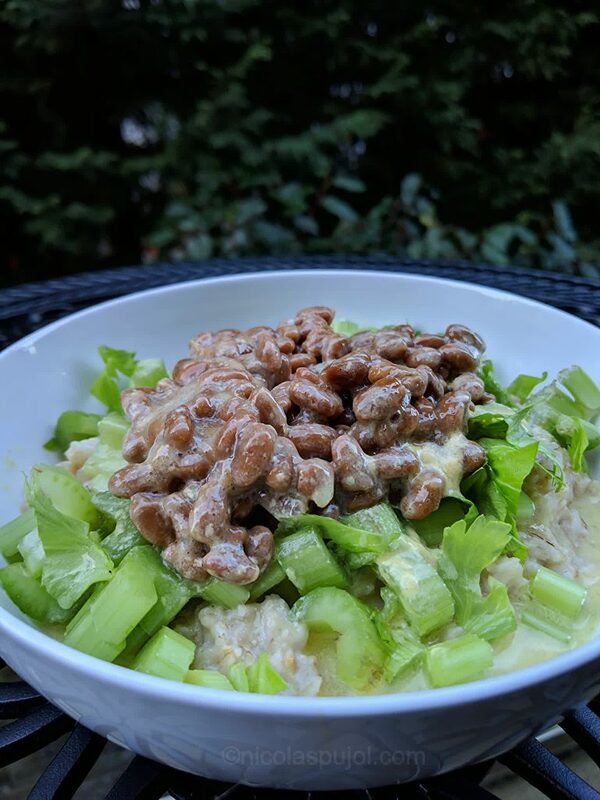 This natto, celery and oatmeal salad with no-oil lemon dressing provides a savory bowl with French mustard. Whole-foods plant-based no-oil (WFPBNO) recipe. Put oats and water in a pan, bring to boil then simmer for 10 minutes. In the meantime, squeeze the lime juice and mix it with the French mustard in a small bowl. Rinse and finely chop the celery. Open the natto box. In a mid-size bowl, place the cooked oatmeal at the bottom, then sprinkle the celery on top. 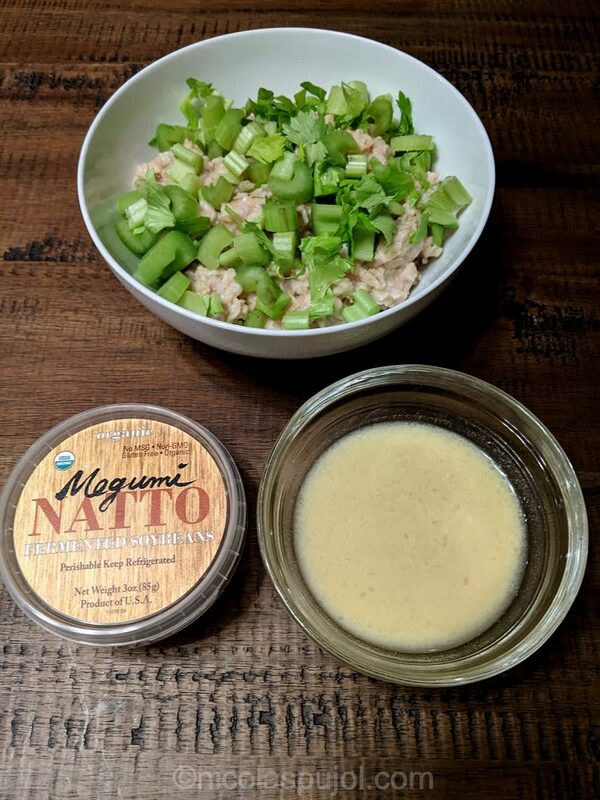 Add the natto and top with the salad dressing.